So you just bought a new 5th Wheel, Travel Trailer or maybe you bought a Class A or C and are going to be pulling a Tow Dolly. Are you ready and prepared to tow it out on the Open Road? Here are just a few tips to consider before heading out so you can safely get to your destination. Many times we are spontaneous. It gives us spice in life but also can cause issues. We recently dodged a big issue and hopefully you can learn from this and not make the same near mistake. We just bought a new 5th Wheel Toy Hauler. It’s absolutely beautiful, but it’s also absolutely massive. It’s 44ft and has a gross weight of around 20,000 pounds! Once we bought it we had to go Truck shopping to buy something to pull it with. We only had a few days to find a truck since we traded our RV in for the 5th wheel we had to move quickly or we would be living at the RV Dealership and as much as they like us, I’m not too sure they would like that… So we went to local dealerships and called around extensively. For what we were looking for we didn’t find many options, then luckily one of the dealerships called me back and said they just got one in on trade this afternoon. We went and checked it out, it was exactly what we wanted and because they hadn’t done the safety inspection we weren’t able to test drive it yet. We went ahead and bought it on the spot anyways. We were so happy! I was laying in bed around 1am and in my excitement I wanted to look up on my phone some of the specs of the truck we just bought. Soon my stomach churned. What I found is that there are 2 engine sizes for that years make and model. The smaller engine had a towing capacity BELOW our dry weight! Which means there was a 50/50 chance we bought a truck that couldn’t even pull the 5th wheel we just bought!!! There was a 50/50 chance we bought a truck that couldn’t even pull the 5th wheel we just bought!!! In the morning I called the dealership and got confirmation that we did have the big engine and were good to go on our tow capacity. DO NOT exceed your tow capacity, you put yourself and others on the road at risk. Make sure everything is locked and loaded, or loaded and locked… Basically you want to make sure that all your stuff that can move around are secured so they won’t fly around when you hit a big bump going down the road. We use a variety of tactics such as using blankets on things that might wiggle and cause abrasion, or putting rods in our cabinets so the mugs won’t jump out when we open the doors. We also use a lot of bungee cords for cabinets etc. 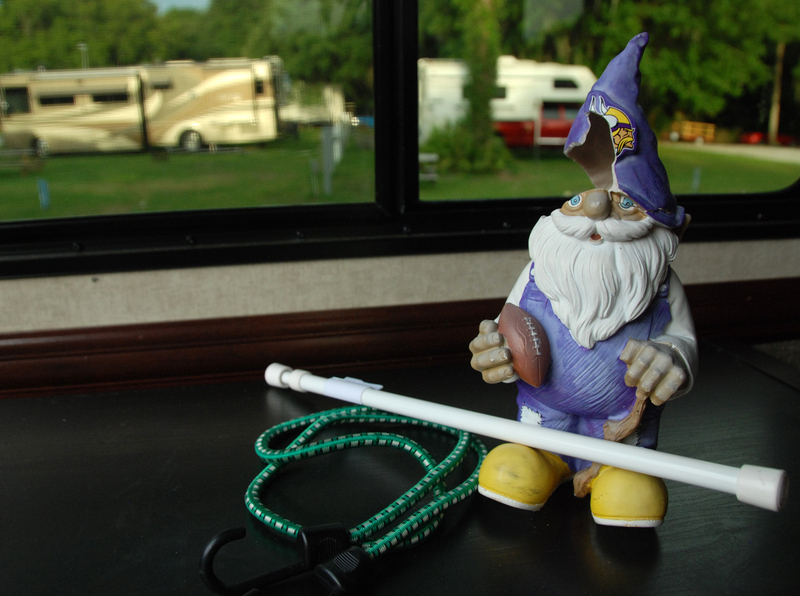 This is an example of what can happen when you don’t secure your camping gnome. I’ve learned the hard way that you will make your life a lot easier to be on a level surface, preferably an asphalt one. Travel Trailers can be extremely difficult to hook up if not on level ground. When we use to pull our car with our Tow Dolly behind our Class C RV a few times we tried to take a short cut and load up on gravel. Every time the tires would spin right as it was loading and would drop the car down and the molding underneath would become more and more damaged. Eventually it became so bad it was ripped off. Since then we took the time to find flat asphalt and had no issues. It seems common that people check their lights before getting on the road. Be sure to check the brake lights, turn signals, and emergency lights. We were camping in Lake Texoma, TX and had were lucky to be present during a rare snow storm. It was amazing because the Thousand Trails Campground we were at had a private beach access that it seemed nobody but myself used, it felt like I had the entire lake to myself! However I think because of all the rain and snow the lights to the tow dolly weren’t working correctly. Luckily when things dried out the lights started working again. This is something I almost learned the hard way. We were at a Gas Station in Texas filling up the RV with Propane when a young guy possibly saved us from a nasty accident. He told me that my tires had bald spots and seemed like I probably shouldn’t be driving on it. I thought he was talking about my car because we noticed the car acting up recently and brought it in and the dealership told us the tires were wearing uneven probably from the tow dolly but still had a few thousand miles left on them. This guy said “No I’m talking about your Tow Dolly”. So we went over and looked at it, sure enough it was a disaster waiting to happen. As soon as we got to our next destination we brought had the tow dolly looked at and it turns out the axle was bent. We also found out that this was the cause of the rear tires on the car acting up and wearing out early in some spots. We were able to get this fixed from a local guy who came to the Thousand Trails Lake Conroe Location, picked up our Tow Dolly and dropped it off fixed up. Good thing we found this out when we did because in a few days we were driving from the Houston area to central Florida! Always do a quick inspection of your tires before you hit the road. When you are towing something keep in mind that a wreck can cause severe damage. Constantly check your mirrors, double check when switching lanes, be extra cautious going up or down hills and be easy on the brakes. Also be pro-active with your navigation. Because we travel together Danielle is my navigator and even though we use google maps on our iPhone, sometimes it can tell you to turn a little late for switching lanes with a trailer. So she tells me well before the turn exactly where I will be turning and we have had smooth towing. It sounds silly to head to a parking lot and drive around for hours, but it’s extremely effective. You need to know how your vehicle will respond and learn the “feel” of your rig. Practice turning, braking and other techniques. Make sure you get reference points in your vehicle to aid you. I spent a lot of time on Youtube learning before I ever got behind the wheel AND I practiced. Two other suggestions for “Tow Like A Pro”. 1) Reduce/Limit speed. The posted speed limit is safe for cars. Less than perfect weather (wet roads, wind, fog or reduced visibility) will require much more attention from the driver.While there may be a minimum speed limit in some areas, there is no need to meet the speed limit if handling is a problem. 2) Check your coupling after every stop. I do a full walk around to make sure that all my lights are still on and nothing is loose on the vehicle. I also check my chains to make sure they are secure, my electric to see that it isn’t close to falling out, my e-brake line, that it is secure and clear from the ground, ready to do its job if needed and most importantly, the hitching itself. Otherwise, you have some very good advice in here. This is just my 2 cents. Those are fantastic suggestions! We couldn’t agree more! In fact one time we cut our lights by turning too sharp without knowing it. Luckily someone let us know. Happy camping! Pretty good advice. Checking tires is a key that I think a lot of people miss. Great article! Thanks for this valuable info!